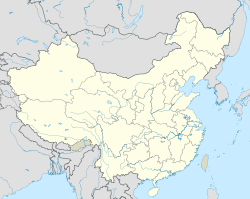 Hechi (Chinese: 河池) is a prefecture-level city in the northwest of the Guangxi Zhuang Autonomous Region, People's Republic of China, bordering Guizhou to the north. In June 2002 it was upgraded from prefecture status. Hechi is located in northwestern Guangxi on the southern end of the Yunnan-Guizhou Plateau. The total area is 33,500 km2 (12,900 sq mi), with elevations increasing from southeast to northwest. It is very mountainous with ranges including in the north the Jiuwanda Mountains, in the northwest the Phoenix Mountains, in the east the Fengling Mountains, in the west, the Duyang Mountains, and in the southwest the Green Dragon Mountains. The tallest mountain is "Nameless Peak" with an elevation of 1,693 metres (5,554 ft). Bordering prefecture-level divisions are Liuzhou to the east, Laibin to the southeast, Nanning to the south, and Baise to the southwest in Guangxi and Qiannan Buyi and Miao Autonomous Prefecture, Guizhou to the north. Hechi has a monsoon-influenced humid subtropical climate (Köppen Cwa) and is generally overcast. The short and mild winters begin dry but become progressively rainier and cloudier. Early spring is the cloudiest time of year, though the monsoonal rains do not arrive until May. Summer is long, hot, and humid, and is the sunniest season. Autumn is warmer and drier than spring. The monthly 24-hour average temperature ranges from 11.0 °C (51.8 °F) in January to 28.3 °C (82.9 °F) in July, and the annual mean is 20.78 °C (69.4 °F). Annual rainfall averages around 1,471 mm (58 in), over 65% of which falls from May to August. With monthly percent possible sunshine ranging from 15% in February and March to 43% in August, the city receives 1,259 hours of bright sunshine annually. Hechi has 2 urban district, 4 counties, and 5 autonomous counties. In 2010 Hechi's population was 3,991,900. 83.89%(2,826,400) of the people belong to the national minority.Ethnic groups include Zhuang, Han, Yao, Mulao, Maonan, Miao, Dong, and Shui. In these ethnic groups, Zhuang population was 2,542,852(63.7%), Yao was 365,910(9.16%).It is home to Guangxi's largest national minority population. Due to Hechi's tropical wet climate, water power is also a major resource. Each year, more than 25 km3 (6.0 cu mi) of water flows through Hechi; 13% of all of Guangxi's water. There are more than 630 streams, creeks, and rivers with a combined length of more than 5,130 km (3,190 mi). Hydropwer facilities on these rivers produce more than 10 gigawatts of electricity; half of Guangxi's hydropower energy. Hechi's climate, weather, and soil make it a major agricultural center. More than 400 types of crops including oranges, pineapple, corn, lotus root, casava, sugarcane, tobacco, vegetables, melons, mulberry, mushrooms and more than 100 different kinds of rice are grown here. Sugarcane is a major crop with more than 220,000 tons of refined sugar produced each year from 360 km2 (140 sq mi) of cane. "Oil" plants such as peanuts, sesame, and grape are also important. Fruit make up a significant portion of Hechi's agriculture. There are more than 200 kinds of fruit found here. 80% of tropical Asia's fruits are grown in Hechi alone. [clarification needed] 120,000 tons of fruit are grown annually on more than 310 km2 (120 sq mi) of land. Forest products are another important industry. Hechi has more than 10,000 km2 (3,900 sq mi) of forest. More than 200 species of wild plants can be used in Chinese medicine. Due to its tropical wet climate, Hechi has an amazing level of biodiversity. There are more than 1800 species of plants, 150 species of trees, 700 species of insects, 50 species of fish, and 60 species of land animals, many of which are rare and protected. Animals such as langurs, pangolins, and wild cats can be found in Hechi's forested mountains. Hechi had Chen Bomin 陳伯民 as its magistrate. ^ Xiaorong Han (7 November 2014). Red God: Wei Baqun and His Peasant Revolution in Southern China, 1894–1932. SUNY Press. pp. 316–. ISBN 978-1-4384-5385-9. This page was last edited on 17 March 2019, at 12:12 (UTC).